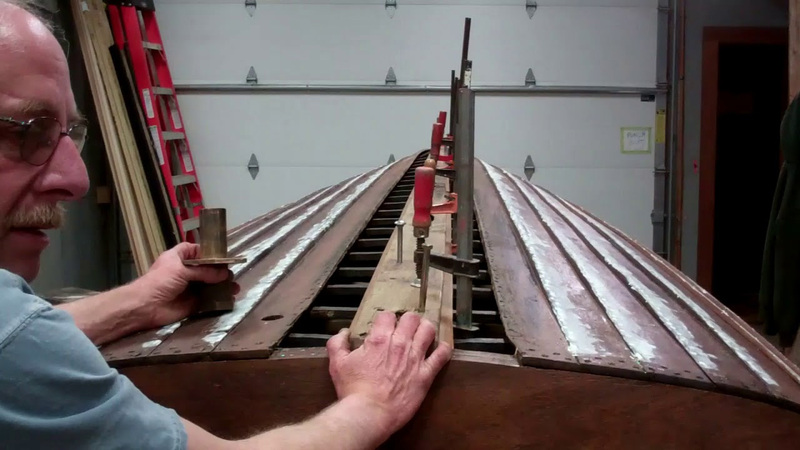 Our 1940 16’ Lyman Yacht Tender’s spine transplant is complete, and the patient is doing quite well. The new keelson and the keel’s underside received three applications of Clear Penetrating Epoxy Sealer (CPES). Following Danenberg, who insists that doing so delivers deeper penetration and more thorough sealing, the second coat was applied immediately following the first coat. The third coat was applied twenty-four hours later. After fitting the keelson and keel to the boat and each other, and sinking a series of temporary position-holding screws through the keelson and into the keel, John bored the rudder and prop shaft bores. He also drilled the holes for the machine-threaded bolts that will secure the lifting ring, yes it is fixed to the keel/keelson and shaft log. After reassembling the now monolith-to-be and driving screws through the keelson into the keel, we installed it on ribs bedded with mahogany 5200. (Any squeeze out here will be visible in the bilge. Even though it will be thoroughly protected with Sandusky Paint Company Lyman sand tan bilge paint, we do not want to risk that a scuff or scrape exposes white 5200 beneath the paint. John has also completed his knee semi-transplant, a truly complicated Dutchman, as well as fashioning Dutchman repairs to the forward end of the gripe. Once everything is sanded in and sealed with CPES, the bow will be ready for primer. We will focus on installing both garboards, which will also be bedded in white 5200, over the next several hours, followed by securing the aft tails of the bottom strakes to the transom. Then Michael “gets” to spend the rest of today and this weekend applying and sanding 3M Premium Marine Filler fairing compound to the countersinks. After a final application of CPES to the entire bottom, and caulking the strake-to-strake seams with 5200, Susan’s bottom will be ready for priming and painting.